The love for nature conservation has driven Doug and Kris Tompkins to take on the amazing task of building turnkey national parks in Chile and Argentina, eventually returning them to these nations’ governments. The future Patagonia National Park’s handbook opens with a quote from the late Doug Tompkins: “For those of us who grew up going out into the wilds of the world…we got into our souls a sense of beauty.” The inspiring power of beauty seems to stand at the core of the infrastructure they have built in all their parks, a continuation of nature’s perfection into man-made architecture and design. 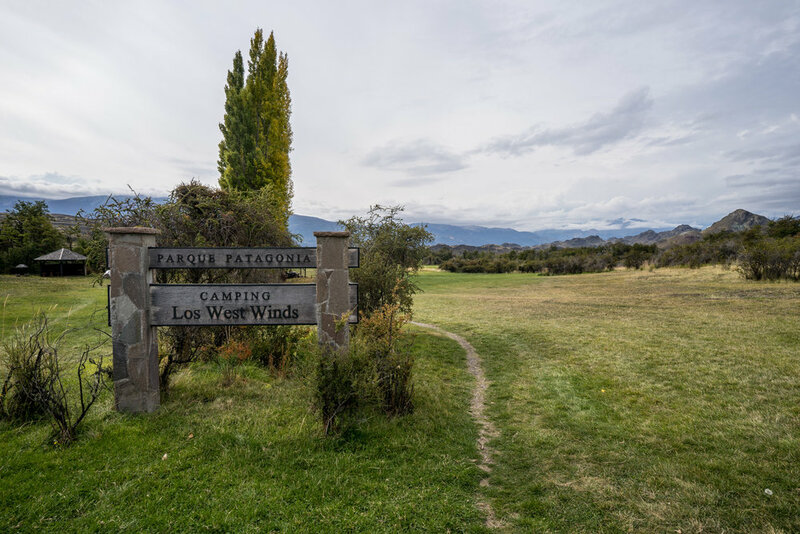 The Chacabuco Valley sits at the heart of what is set to become the Patagonia National Park, an area of about 640,000 acres, when including the Jeinimeni and Tamango National Reserves. Chilean Patagonia is typically a wilderness of mountains covered by ice and snow fields, strong rivers, wet and lush forests and vast grasslands in the south. The Chacabuco Valley is a pocket of steppe and dry land, a corridor of connection between the ecosystems that dominate the Argentine side of Patagonia with the dense Chilean forests created by the Pacific’s wet weather. It is also a missing piece in the puzzle that connects the two reserves which sit at the northern and southern borders of this land. 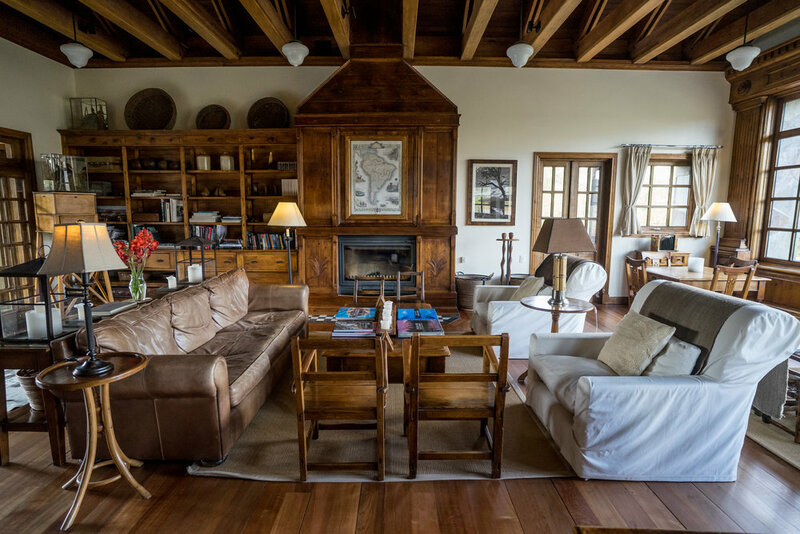 The valley used to be one of Chile’s largest sheep ranches and, since it was bought by Conservacion Patagonica in 2004, it became the most ambitious and maybe the most iconic of the Tompkins projects. We arrived at the park’s headquarters one sunny afternoon at the end of March, after a short car ride from the town of Cochrane. A large herd of guanacos were hanging out in front of the offices and the restaurant. The buildings’ simple lines, with massive rocks and recycled wood structures, were perfectly integrated in the landscape. As we would soon discover, the interiors seemed to be a perfect illustration of the pursuit of beauty that seemed to drive Kris and Doug’s vision for the infrastructure of the park. 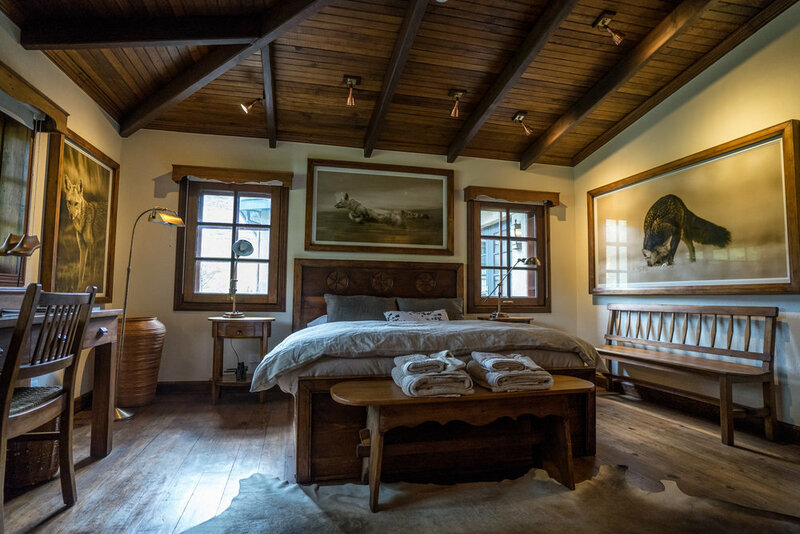 From hanging bridges, to pictures hanging on the walls, and to the incredible wood carvings, behind every detail one can see the work that went into creating objects of the highest quality. 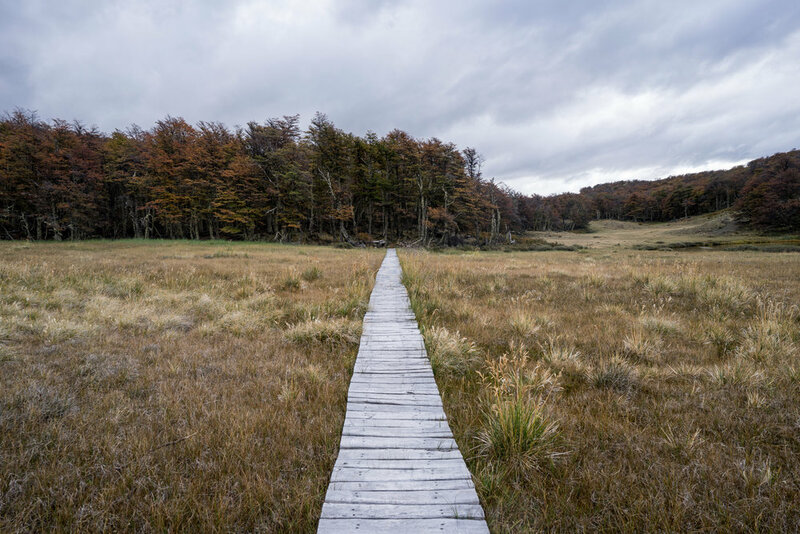 All this infrastructure is included in the donation of the lands to the Chilean government with the purpose of creating the Patagonia National Park. The first formal steps of this move were taken at the beginning of 2017. There is no entrance fee charged to the visitors for the time being. Many come for the day, others come to stay for a longer time. For the latter, there are two options which go in very different directions: on the one hand is the lodge which charges several hundred dollars per night for the room, and on the other there are campsites which are around USD $11 per night. 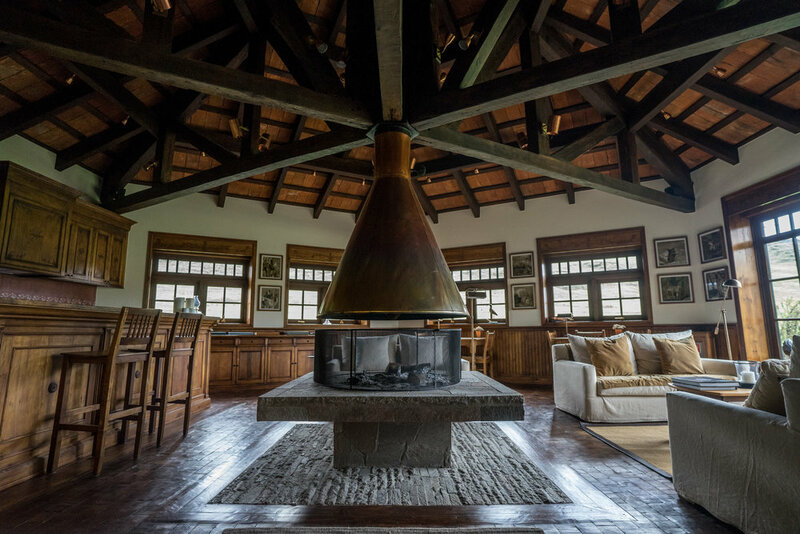 Those staying in one of the ten bedrooms at the lodge will enjoy a kind of mindful luxury that gives back to conservation, while the others will find that the same careful design and focus on quality and comfort are present in the campsites as well. We spent the first week in the park learning more about its creation, the process of donating it to the Chilean state, exploring some of the trails, and talking to those involved in its management. On one of these days, Johanna Zajc, Lodge and Restaurant Administrator, offered to sit down with us to discuss more about the visitation in the park, but also about the standards of beauty that have the power to inspire others and to turn them into ambassadors of this conservation project. "We’re trying to do it this way to be aligned not only with the idea of nature conservation, but also to help preserve the people’s way of life in the region"
Speaking of sustainability and promoting a local culture, Johanna explained how the menu is set daily in the restaurant in order to reflect the seasonal availability of produce. Aside from buying products from the region, the park also has its own organic vegetable garden. "50% of the world’s food ends up as waste so in order to avoid that we’ve made it a purpose to use absolutely everything that comes from the garden"
“50% of the world’s food ends up as waste so in order to avoid that we’ve made it a purpose to use absolutely everything that comes from the garden: leaves, roots, tubercles. And we want it to be fresh. We pull it from the garden and we work with it. If we have too much kale we make a menu with kale salad, kale soup, we make kale tart”, she laughs. On a serious note, she adds that this is all done in order to reduce waste and create meals that absorb the surplus. Apart from this daily menu which gives them the freedom to work with what they have most, the restaurant also offers standard choices that are centered around the same idea of seasonal and regional availability. The high standards of quality that motivate every aspect of the park’s infrastructure are also present in the food and drinks on offer. With all this high-quality infrastructure already built in the park, the vision is to help it be a self-sustained entity when it finally transitions to the government. As we learn from Johanna, tourism currently brings some of the income, but not enough to cover all costs because many of the projects left to complete in the park are still on a large scale: road building, trail marking, hanging bridges, parking lots, outlooks. In the future, the surplus brought by tourism would go towards sustaining conservation projects and rangers patrolling the more remote areas of the park. The visitation is increasing annually and for the 2016-2017 season she approximated that there were at least 8,000 people that came through the park. 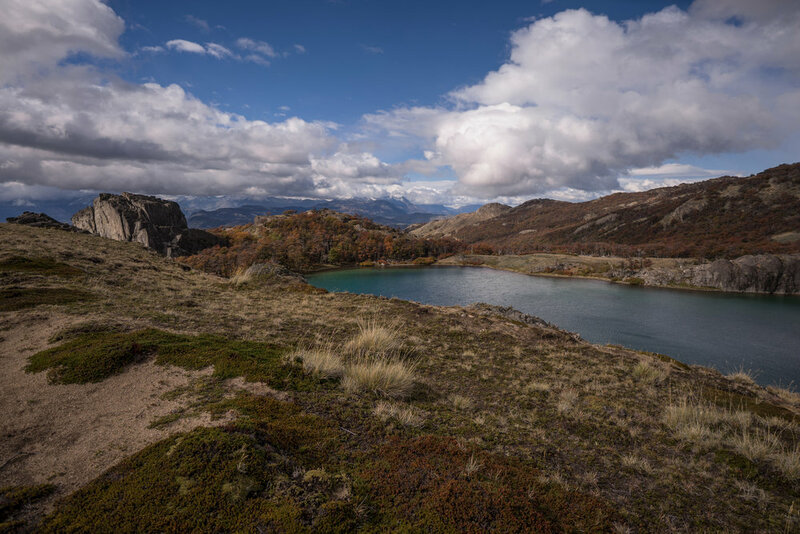 With conservation at its core, the Patagonia Park, Johanna says, will not become the next Torres del Paine. She does acknowledge, however, its high potential to attract visitors and, therefore, the need to find ways to distribute them sustainably on trails and to prepare the park for their growing numbers. "A person that leaves here inspired has the potential to inspire more people. Therefore, the best way to inspire is to surround yourself with beauty"
What Johanna called, with a smile, "the Honeymoon Suite"
"That’s my new motivation: sustainability in everything; for a thing to last without causing damage, without breaking, without contaminating, without it getting drained from mismanagement"
This part rang true because for the entire time we were in the park we were touched by the little details that made all the difference. From the perfection of the garden to the beauty of the woodwork of the interiors, as well as the great work of nature conservation, there were all sorts of things that were triggering a nesting instinct and the appetite to replicate in a form or other, at a personal level, what we were seeing in the park. We wondered, though, how much of this was touching the minds of the local community who in the beginning received the creation of the park with skepticism? "They will be the future beneficiaries of the park and it’s important to understand it and for it to be part of their education"
“We’ve been doing dedicated work to implement what is known as ‘social tourism’. We go to local schools and speak to teachers and principals and invite them to bring kids to have a day of classes in the park. We provide food and transportation. In the beginning, it was really hard in Chile Chico and Cochrane. The latter is seeing more success now. Schools here have one day a year when they have to come and participate at lessons in the park. Recently someone in Chile Chico reached out as well to partake in the program. Slowly things are moving around. It’s enough for one of them to say yes to inspire the others. I started talking to several of the kids in the first group I saw, interested in understanding what they were thinking. A 9-year-old girl said ’It’s so beautiful’. I said ‘Good, so if you like it bring your family as well with you for the weekend’. To which she responded: ‘No, no way. My mother wouldn’t allow me to visit if it wasn’t mandatory from school’. At the end of it, it doesn’t matter so much that the mother refuses to come. In a way that’s a lost generation for us, we probably won’t change them. We can change these kids by opening the doors to the park, though. They will be the future beneficiaries of the park and it’s important to understand it and for it to be part of their education. On the other hand we have the elders who are very stubborn in their convictions. We invite them to spend a day in the park. We don’t want to change their mind, we just want them to have an enjoyable time and to maybe see that some of the prejudices they have against the Tompkins aren’t based on reality. We try sometimes to bring the mothers with kids, try to find ways to convert this lost generation, but it’s harder. The typical public in the region that could and should come and take advantage of all this isn’t coming enough. They are the people that were young when all this land was acquired and they were reaping the benefits of the surplus of sheep and lamb available at the ranch, buying meat for low prices." The model of conservation in the future national park is a mix of ecosystem protection and restoration, with responsible tourism. Projects like this can revive local cultures and change regional economies, while bringing back the health of lands that were previously destined to exploitation. For outsiders and travelers like us, the beauty of everything built here, and the passion for conservation can inspire us to understand the power our lifestyle choices have and the difference we can make upon settling down on a piece of land.